Before Disney art director, animator, and writer Ken Anderson's death, historian Paul Anderson spent hours talking to Walt Disney's "tenth old man". 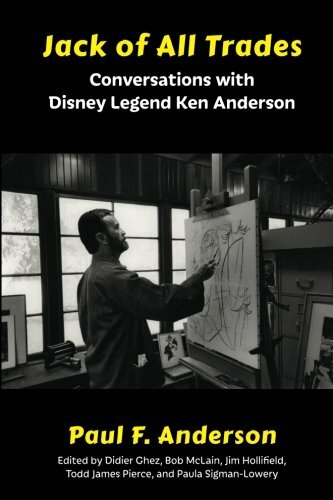 Their candid, revelatory conversation, presented here for the first time anywhere, charts the creative life of this multi-talented Disney Legend. Walt Disney famously called his top nine artists and animators the Nine Old Men. Like the fifth Beatle, there was a tenth old man: Ken Anderson. A jack of all trades, Anderson was equally adept in the studio working on films like Snow White and the Seven Dwarfs and One Hundred and One Dalmatians and as an architect and designer of Disneyland and Epcot Center. Despite an occasionally rocky relationship with Walt, Anderson was trusted with the studio's most important films, and later became an integral part of the Imagineering team responsible for Disneyland. At times reverential, at times critical, but always revealing, Anderson gives an unvarnished, insider's account of the Disney film and theme park empire like no other. Over the course of 20 meticulously transcribed and edited cassette tapes, recorded before Anderson's death in 1993, you'll enjoy a unique, extensive, first-hand account of the earliest days of the Disney studio through the decades after Walt's death.